I'm ready for my close-up! Dippy the Diplodocus carnegii cast poses for a photograph at the Museum. When Dippy, the Museum's much-loved Diplodocus, was revealed to the public in 1905 he became an instant star, featuring in news reports and cartoons. He went on to appear on TV and to inspire Disney's One of Our Dinosaurs is Missing. Here, Dippy shares some of his memorable moments from the Museum Archives. I travelled from the USA by steam boat in 36 crates. Newspapers published drawings of me being put together in the Museum for the first time in 1905. I was presented to the Museum by millionaire Andrew Carnegie (standing on the left of this sketch) after King Edward VII said he'd like a Diplodocus for the Museum. My grand unveiling took place on Friday 12 May 1905. I was the first full skeleton of a sauropod dinosaur ever displayed anywhere in the world. Newspapers called me 'the greatest animal that ever lived'. I also inspired this cheeky cartoon, which suggested my huge frame could be used to store visitors' coats and umbrellas. I moved around a lot in the Museum. My first home was in the Reptile gallery (now the Human Biology gallery), where I stayed until 1931. Many friends kept me company at the Museum, including crocodiles, tortoises and Triceratops. I hope to make some new friends while I’m on tour around the UK. This photo from 1911 shows my long tail, which contains more than 70 bones. The Museum had to keep a box of spare tailbones as people often took them for souvenirs. In April 1940 I was moved to the basement to protect me from the bombs falling on London during World War II. When it was safe again, I was put back on display, this time in the Fossil Reptile gallery (now Creepy Crawlies). I made my first appearance in the Museum’s Hintze Hall in 1979. For a while, Triceratops joined me. In 1993 my tail was remade in a lighter material so that it could be held in a new position off the ground. I was given a cardboard tail while I waited for my new one. My tail position was changed because scientists investigating how dinosaurs walked realised that Diplodocus would have held its tail in the air rather than dragging it. I stood in Hintze Hall until January 2017, greeting visitors as they entered the Museum. I’m very excited to go on tour to meet even more people around the UK. Taking me down from Hintze Hall was a big job. Scaffolding and special lifting equipment had to be used so the Museum team could carefully lower me to the floor, piece by piece. My skeleton contains 292 bones, copied in plaster of Paris and resin. It took more than three weeks to take me apart! Some of my tailbones are shaped like coat hangers. When the first Diplodocus was named in 1878, this two-pronged shape had never been seen in a dinosaur before. It inspired the name Diplodocus, which means double-beamed. It may look a bit like Nikki is feeding me, but she is really getting ready to take my head off so that I can be prepared and packed off to get ready for my UK adventure. It's important to clean your teeth regularly, even if you're a dinosaur cast like me. Two special Dippy cakes were baked for the Museum to wish me good luck on my travels. One cake was even cut by HRH The Duchess of Cambridge at a Museum party for a group of schoolchildren. Join Dippy on his natural history adventure across the UK. Cleaning Dippy the dinosaur takes more than a quick flick with a duster. Exhibition specialist Helen Walker talks us through it. 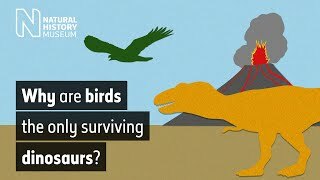 What were the largest dinosaurs in Britain 200-145 million years ago? And why were they so big?